A short overview of the key regulations governing wages, payments, and entitlements in the UAE. All GCC countries except for Bahrain have electronic wage payment systems in place. These Wage Protection Systems (WPS) are intended to reduce or eliminate non-payment, delays in payments and unfair deductions. However, issues with deductions, delays, and non-payments still persist and affect lower-income migrants the most. These issues remain, in part, due to design flaws with the systems themselves and poor enforcement mechanisms. They also persist because the laws governing wages and benefits are not always clear; lower-income migrants especially are least likely to be informed of the breakdown of their basic salaries, and in-kind payments (such as lodging and food), as well as their overtime dues and entitlements. This information is critical in order for workers to recognise whether their wages are being unfairly deducted. Wage structures also impact end-of-service benefits, which are calculated based on the basic salary. Many migrants rely on these benefits as a savings plan of sorts in absence of other welfare or pension schemes in either countries of employment or of origin. 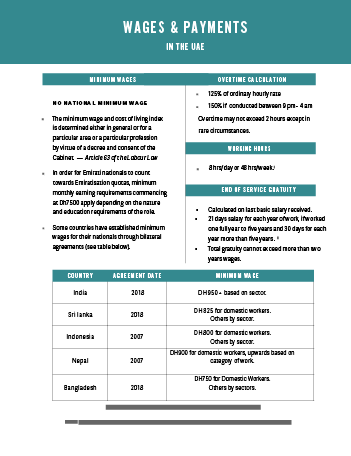 The following document is a non-exhaustive outline of the laws governing wages and payments in the UAE's private sector, in non-free trade zone areas. It is a working document.